I have to confess, I’m a bit of a handwriting junkie. I do a lot of my writing by hand, using nice fountain pens and a whole range of notebooks and types of loose papers, as the mood takes me. I even did a lot of this very article by hand. There’s an excitement to filling up pieces of paper with handwritten words, a sense of accomplishment that doesn’t necessarily happen with computers (which have their own feelings of accomplishment). My love of handwriting extends beyond my own, though, into a happy obsession with handwritten manuscripts from the past. Whether it’s works by famous authors, or illuminated manuscript pages, or even the doodle-notebooks of famous film directors. I once bought a second copy of The Dark Crystal solely because it came with a reproduction of one of Jim Henson’s yellow legal pads, full of his writing. (Ironically, it was almost incomprehensible, but I didn’t care, I loved it.) And of course, there’s the glory that is Guillermo del Toro’s notebooks. Over the past few years, manuscripts have begun to appear online for famous novels. It’s like Christmas for me every time one appears online (and then I begin daydreaming about how I can print them out and have a whole handwritten novel by someone I adore). I wanted to show you a few, so you too can get overly excited about someone else’s ink blotches and bad handwriting. Some of the pages are disastrous-looking. This is a GOOD PAGE. Anyone who has foolishly spent any time with me without first coming up with an escape plan knows that I have a weird and very deep obsession with Charles Dickens (very deep, because my god have I read a lot about him at this point. weird because I actually don’t care all that much for his actual fiction). In the course of my endless biography reading, I’ve come across many pages that he’d written. Scraps from various novels and short stories, letters that he wrote friends (those that survived; in his old age, he began obsessively burning all his correspondence) and even signatures on receipts and marriage certificates. This, however, is far more exciting. This is the complete handwritten manuscript for A Christmas Carol, which we could argue is Dickens’ most famous book, if for no other reason than for the way in which characters like Ebenezer Scrooge slipped out into the common language and pool of ideas. Having a complete manuscript is exciting, because you can read the entire book in Dickens’ own hand, if you want to. Of course, you might find that impossible, because Dickens handwriting is terrifying. First, because his handwriting looks like it’s being done by someone who is having a fight at the same time, and second because he crosses stuff out, makes corrections, and writes all over the page until it’s like trying to parse a novel out of a wall covered in layers of graffiti. Happily, The Morgan Library & Museum has done us a tremendous favor by putting all the text of each handwritten page into a little box next to the pages itself. Rather than trying to parse out the pages, or bounce back and forth between a copy of the book, you can sit and read your way through. It’s a wonderful experience. Beowulf is more or less an old-timey action movie, honestly. An ancient oral tale which was handed down through many generations before finally being written, it is the story of Beowulf and all the action that he encounters. First he sails to help some neighboring Danes who are being troubled by a monster, Grendel. To help them, he fights Grendel and defeats him by tearing his arm off. Grendel’s mother comes looking for revenge, so Beowulf goes and fights her in her underwater lair. And then, we jump fifty years ahead where old Beowulf goes and deals with a dragon, killing that too for good measure (but becoming mortally wounded and dying in the process). I have just described Beowulf so very poorly that Professors reading this have all had to step away and have a bit of a lie-down. I can only apologize. Anyway, it’s actually more exciting that there are manuscript pages of Beowulf to look at at all, given that it is not only very old and fragile, but also that people were generally not interested in it at all. It was only in the 1800s that anyone treated it with any significance. It’s online and a great deal of fun to look at, although completely unreadable (at least for me). 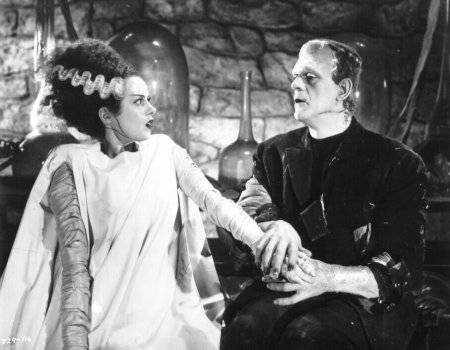 A photo from BRIDE OF FRANKENSTEIN, maybe the finest early horror film. The line “WE BELONG DEAD” gives me chills, even just remembering it. I trust that I don’t need to recount the plot of the novel Frankenstein for you, and indeed if I do, then you have revealed yourself as a space alien who did not do their research. Frankenstein and his monster (REMEMBER: Frankenstein is the Doctor, not The Monster, this is one of my only pet peeves dammit). What I will tell you is how very important Frankenstein is for me, personally. It’s probably my favorite classic novel, certainly my favorite classic horror novel, and the Monster is my favorite of all the classic horror movie creatures, at that (coming in a close second: the Creature from the Black Lagoon. But we’re wandering off-topic now…). I not only love the story and the Monster himself, but I love the structure of the book. How it’s nested. First, it’s the Fishermen’s story, as they find Victor Frankenstein half-frozen on an ice flo. They rescue and as he revives, he begins to tell his story. In the course of his story, he meets up with the Monster again, who begins to tell his story. And then we go back out of each story. It’s my favorite story structure, if one can be said to have a favorite like that.